Sears and Blockbuster fell because neither was able to adapt and grow with its consumer base. Is Facebook making the same mistakes? Over the last several years, Facebook has gone from facilitating the free flow of information to inhibiting it through incremental censorship and account purges. What began with the ban of Alex Jones last summer has since escalated to include the expulsion of hundreds of additional pages, each political in nature. And as more people become wary of the social media platform’s motives, one thing is absolutely certain: we need more market competition in the realm of social media. Facebook might seem too big to fail, but rest assured it is not. Unless it is protected by a government monopoly, every single product and service is vulnerable to market forces, even those considered too powerful. Just a few weeks ago, the once-mighty Sears announced its plans to file for bankruptcy and close 142 of its department store locations. It also wasn't so long ago when Blockbuster Video, a staple of weekend fun in the 90s, announced its closure, as well. These institutions were at the top of their games at one point but were each unable to satisfy their customers as they once did. And both were inevitably replaced by better services like Amazon Prime and Netflix. Facebook might seem different from other traditional market entities since it technically doesn’t sell anything to the bulk of its users. But just like Sears and Blockbuster, its success relies on its ability to attract and maintain its customers. And in the wake of the recent purges - and its recent security breaches - it is quite possible that, like Myspace and Friendster, Facebook is not long for this world. When it was announced that Facebook, YouTube, iTunes, and eventually Twitter had banned the accounts associated with Alex Jones, it elicited mixed reactions from the public. On one hand, Alex Jones is infamously known for building his career on being an instigator and a “troll,” rendering him an unsympathetic character to most of the American public. On the other hand, the sweeping ban of Jones was concerning as it threatened the future of independent media. After all, if this could happen to Jones, who would be next? To be sure, Facebook is privately owned and is allowed to curate its own content as it sees fit. However, just because someone can do something doesn’t necessarily mean that they should. And it most certainly doesn’t mean that, as users of this platform, we should not voice our concerns. As the summer droned on, independent media held its breath waiting to see how the “Jones” decision would impact their own accounts. A few weeks ago, the situation escalated when Facebook went one step further and announced it would be deleting nearly 800 pages it said violated its terms of service. Specifically, these pages were accused of “spamming” users, though Facebook’s use of the word was not clearly defined. However, the fact remains that many of the deleted pages were right-leaning and libertarian, leading many to assume that these purges were politically motivated. And given the prior accusations made against Facebook in regards to suppressing conservative-leaning links and news stories, these assumptions did not seem off-base even if Zuckerberg claimed that content was not a contributing factor. 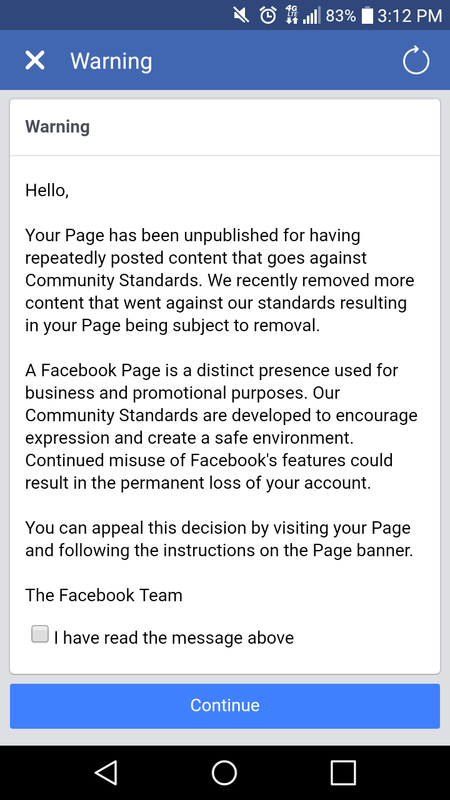 According to Facebook, we were not suspended for our content but for “spamming” and using “misleading” practices, but these are tactics we have never employed, and other large pages that employ posting strategies like ours, such as Occupy Democrats (also known to share fake news), were not removed. Curiously, in July, Facebook assigned us a representative to help us manage our page. They also gave us $500 in free advertising to boost our content in September, and these actions seem to imply they had no issues with either our content or our practices. Even though the purge’s proximity to the approaching midterm elections appears suspect, Facebook maintains that its decision to delete these accounts was purely the result of spam violations and not because of the actual page content. This allowed Zuckerberg to hold firm to his claims that Facebook was not practicing censorship but was instead just enforcing policies that already existed in the user terms of service. However, last week the popular libertarian Facebook account “Liberty Memes” had its page deleted, adding more fuel to the fire. Unlike the previous purge, Liberty Memes was not deleted under the guise of spamming its users like the others. Instead, Facebook openly admitted that the page was being deleted directly because of its content. In the digital age, it is highly probable that at some point you will come into contact with content you find offensive or untrue. While offensive content can simply be ignored and dismissed, ideally, each individual should be responsible for determining whether or not the information they are exposed to is credible. But with the “fake news” hysteria we are currently experiencing, Facebook has taken it upon itself to protect its users from potentially misleading or even offensive content. And even if these decisions were made in an attempt to appease the many users who would like to see all opposing thought suppressed, this may inevitably come back to haunt the company. Facebook has not had a great couple of years. In addition to being blamed for both the suppression of conservative links and Trump being elected to office, the popular social media site was also found to have compromised its users’ data on more than one occasion. And while the decision was voluntary, Zuckerberg also found himself testifying in front of Congress just a few months ago. And on the business side of things, market shares have slumped 7.5 percent over the year. In fact, over the past year, Facebook use has also been dwindling, and over 44 percent of young users have admitted to deleting the app off of their phones entirely. In droves, young people are flocking to sites like Snapchat, Instagram, YouTube, and Twitter, instead. And without this younger crowd, Facebook could soon find itself desperate for users. Recent findings make it clear that a large number of users have changed their relationship with Facebook over the past year following the company's privacy and security scandals. With ripple effects still being felt over six months after Cambridge Analytica, it's unlikely migration from the app will slow down any time soon. So, what does this mean for those of us who are dissatisfied with the behavior of Zuckerberg and Facebook? It means the situation is ripe for new platforms to rise up and take its place. And we should be diligently searching for its replacement or replacements. Voting with our dollars is one of the most powerful actions we can take as consumers. While we might not be paying for Facebook memberships, each time we log-on to the site and actively engage with other users, we are voting in favor of the social media company. And for many of us, we feel as though we have no other choice. As a writer, I will be the first to admit that I personally rely on Facebook as a means of sharing my work with others. In fact, the thought of deleting my account fills me with unease and isolation. After all, if I am not on Facebook, how can I stay connected to all my contacts around the globe? And since many of us are so hesitant to leave, Facebook has maintained its power in the social media space. But this can easily change. There is a grave misconception that the market process is passive when quite the opposite is true. In order for the market to work, consumers must diligently vote with their feet and their money in order to prop up the brands and products they prefer. If a company does something a consumer is opposed to, the consumer can decide to take their business elsewhere or, in extreme conditions, turn to protests and boycotts as we have seen recently with brands like Nike. Consumers have substantial potential to cause financial harm to these companies, they just have to choose to use this power. We are living in an era of disruption. Just a few years ago, the potential for Bitcoin and other cryptocurrencies to compete with global currencies seemed unfathomable. And while we are still years away from a full-fledged monetary revolution, crypto has proved itself to be a force to be reckoned with in the finance world. If anyone has any doubt of this, just look at how many governments and Keynesian economists fear its widespread adoption. In the earlier days of Bitcoin, users were small in number as the network was still in its infancy and needed to grow. But over the last couple of years, more and more users have been flocking to cryptocurrencies after becoming disenchanted with centralized financial institutions. The very same thing could happen to Facebook. And speaking of the world of cryptocurrencies, many of the platform alternatives to Facebook that are popping up are utilizing blockchain technology. Minds, Telegram, Steemit, Mastadon, and other burgeoning social media companies are looking to blockchain to not only keep private user data safe but also to keep the networks decentralized and safeguarded against the same type of censorship we have seen coming from the authority figures in charge of Facebook. But in order for any of these platforms to take off, they will need early adopters and users willing to build a modern social network that has learned from the errors of its predecessors. Sears and Blockbuster fell because neither was able to adapt and grow with its consumer base. Facebook has routinely gone against the wishes and needs of its users and is just now starting to face the consequences. Just as people across the political spectrum are fed up with the current system, so, too, are social media users frustrated with the major platforms currently dominating the market. In both cases, it seems not only obvious but also vital that instead of simply tolerating the current paradigms, individuals must take tangible action to make their preferences known. With respect to social media, if enough people walk their increasingly dissatisfied talk, there is huge potential to spark an exodus towards platforms that better meet their demands and expectations.